Signature Arts, Inc.: It seems the Auction House formerly called Mastro is in trouble again!! It seems the Auction House formerly called Mastro is in trouble again!! 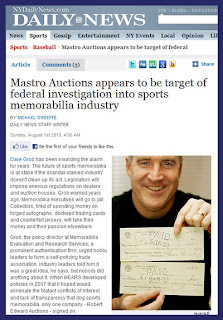 Here is an interesting story from the New York Daily News detailing the latest problems for the former Mastro Auctions. Written by Michael O' Keeffe. Will this kind of stuff ever end? "Bombshell court documents filed by the president of a New Jersey card-grading firm say the company formerly known as Mastro Auctions knowingly sold him an altered baseball card and placed fake bids on items to artificially jack up prices. The counterclaim and third-party complaint filed late Wednesday in Illinois state court by Dave Forman of SportsCard Guaranty also says that former Mastro president Doug Allen sold a Joe Jackson T210 card for Forman in September 2009 to New York collector Corey Shanus for $300,000. But Allen told Forman that the card only sold for $250,000 - and then pocketed $50,000, the documents say. Allen's spokeswoman, Julie Stoklosa, disputed the allegation, saying that Forman told Mastro Auctions that he would sell the card for $250,000. Mastro officials kept the additional $50,000 as their fee for finding a buyer. "This is just another example of their fraud," countered Jeffrey Lichtman, one of Forman's attorneys. "It was flat-out thievery." Forman's filing offers a glimpse into the Justice Department's three-year investigation into Mastro Auctions and its founder, Bill Mastro, which has focused on allegations of shill bidding, card doctoring and other fraud. One of the former Mastro employees cited in the complaint, Pete Calderon, testified before the grand jury that has been reviewing evidence gathered during the government's third major sports memorabilia probe in 15 years, according to a source familiar with the investigation. Other witnesses who have appeared before the grand jury have testified about allegations included in the documents, the source said. Forman says Allen told him in 2007 that he wasn't worried about the investigation because Mastro officials had destroyed all bidding records prior to 2007 "that would expose its fraud." Shill bidding was an open secret at Mastro Auctions, according to the complaint. "In May 2006, Forman overheard Mastro on the telephone with a collector named Chris Larson. Forman overheard Mastro discuss that Larson wanted to buy a L-1 leather Ty Cobb item and was willing to pay up to $41,000 for it," the counterclaim says. "Forman had been keeping an eye on that item during the auction, which was bidding for $17,000.00 at the time of Mastro's conversation with Larson. However, several minutes later, the item was bidding at $41,000 and Forman believes that this was a result of the entry of fake bids by Ketap employees." The court documents, and a motion for protective order that was also filed on Wednesday, say Mastro Auctions controller Walter Tomala violated Illinois and federal laws by making 34 harassing phone calls in 46 minutes to Forman's home between 1:58 a.m. and 2:44 a.m. on Sept. 10. "I'm going to bring you down - one way or another, I'm gonna bring you down, because you are a piece of --- and your brother's a retard, so I will bring you down," Tomala, who first identified himself as "Bill Mastro," allegedly said in a message left on Forman's home voicemail. Tomala sent an email to one of Forman's attorneys to apologize for the phone calls shortly after the incident. "I had a bad day yesterday and I unfortunately took it out on Mr. Forman," Tomala's email said. Attorneys representing Mastro and Allen did not return calls for comment. Mastro Auctions was once sports memorabilia's biggest and most important auction house, reporting $45 million in revenue in 2006 and 2007. The company specialized in rare and expensive collectibles, catering to wealthy collectors who don't blink at the prospect of spending $100,000 or more for a baseball card. Bill Mastro was sports memorabilia's undisputed king, hailed in the media as the nation's top memorabilia dealer. But the Chicago-area auction house, now known as Ketap Company, shut its doors in March 2009, several months after the Daily News first reported that Mastro Auctions and its executives were at the center of an FBI investigation into shill bidding, card doctoring and other allegations of fraud. Allen and other former Mastro executives purchased Mastro Auction's assets and launched a new company called Legendary Auctions. Allen and his partners vowed that all Mastro Auctions business will be "seamlessly facilitated, processed and completed through Legendary Auctions," but many consigners complained they had been stiffed by the company. Allen told The News last year that Mastro Auctions was struggling with cash-flow problems because some bidders had not paid their bills. The company filed a lawsuit in June 2009 alleging that Forman owes Mastro more than $400,000 for items purchased n 2007 and 2008 auctions. Forman's counterclaim says Mastro Auctions failed to credit almost $22,000 to his account from the sale of baseball cards and comic books the auction house sold on his behalf in 2008 and 2009; the company also owes almost $157,000 for vintage baseball cards Forman consigned for auction but were never sold or returned. The counterclaim also says Forman purchased a 1913 T200 card in 2008 for $13,200. Forman later learned that when Mastro had sold the card in 2004 for almost $3,900, the catalogue noted that it had been altered - a fact that had been omitted from the 2008 catalogue. Doctored cards are generally worth much less than cards that have not been altered. "Mastro instructed Pete Calderon, a Ketap employee, to change the description for the Joe Jackson Fatima by omitting the material fact that it had been rebacked prior to the May 1, 2008 auction," the complaint says. "The rebacking of the Joe Jackson Fatima significantly devalued the card." According to the documents, Mastro officials also used the names of several associates - including Andrew Filipowski, the entrepreneur whose private investment firm purchased the auction house in 2005 - to create accounts for shill bids to artificially escalate prices and auction house commissions." For the sake of accuracy it should be stated by me that Mr Forman's attorney is an acquaintance of mine. He is a vital member of Net54 the leading website forum on the internet to discuss collecting.